Getting the chemicals balanced in the hot tub does not have to be a chore. Using the Monday-Wednesday-Friday program, spa water maintenance is easy. Some things to be aware of about pH and hot tubs. The pH scale goes from 0 to 14 with pH of 7 being neutral. Anything higher than 7 is base and lower than 7 is acid. Running the spa with low pH is very bad for the hot tub and can cause equipment damage. 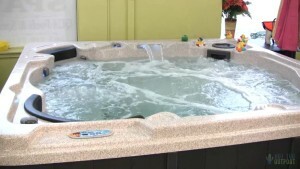 Problems with pump seals, o-rings, gaskets, heaters and pumps as well as leaks may be a result of operating the hot tub with water that has low pH. The solution is to keep an eye on the pH level with test strips and add Spa Up or PH increaser to maintain the 7.4-7.6 ideal pH range. This can put mineral deposits on the shell and make your spa feel like sandpaper. High pH can cause calcium carbonate to precipitate creating a white coating all over the spa. Operating a spa with high pH also causes cloudy water and is not good for the spa. The ideal range to maintain hot tub water in is between 7.2-7.6. Better is between 7.4-7.6 just so there is no danger in the spa slipping into acid water mode below 7 pH. Have Spa Up and Spa Down on hand and add whichever one is needed to keep the pH in the ideal range. This is the other very important chemical for maintaining hot tub water. Be sure to have enough bromine or chlorine in the water. The amount of sanitizer can be somewhat reduced if using either a bromine salt system or ozonator. If using a mineral stick, they can also be reduced, but never eliminated. QCA Spas has a chemical dispenser for tablets right inside the filter and the amount of bromine or chlorine added can be regulated on the device. Alternatively a floater can be used to dose bromine or chlorine. 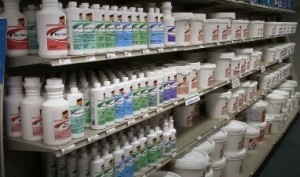 Find filters, covers, spa chemicals and accessories and supplies from the Hot Tub Outpost, www.HotTubOutpost.com.